Five meet records well by the wayside on day 1 of the 2018 North Sea Swim Meet in Kristiansand, Norway, along with a pair of Norwegian Junior Records. Four of the meet records came on the women’s side. Marjolein Delno of the Netherlands got things started off in the first event of finals, slashing just over two-tenths off her personal best (set at this meet last year) to dip under the women’s 200 IM record in 2:10.41. The previous mark of 2:10.49 was set by Sweden’s Petra Granlund in 2011. 17-year-old Malene Rypestol lowered the Norwegian Junior Record in 2:10.69 to finish 2nd, and Belgium’s Fanny Lecluyse took 3rd (2:12.58). Lecluyse also had a win in the 100 breast, where she went 1:06.12. Another one of Granlund’s records fell in the women’s 200 fly, where German Franziska Hentke clocked 2:05.06 to take down the Swede’s 2010 mark of 2:06.66. Hentke’s countrymate Sarah Kohler took out the women’s 800 free meet record by close to ten seconds, putting up an 8:19.55 to break Julie Lauridsen‘s 2014 record of 8:29.15, with the Norwegian youngster Rypestol taking 2nd in 8:39.47. Maaike De Waard of the Netherlands was the other record breaker on the women’s side, dropping the women’s 50 back record down to 26.99 in the prelims and then re-breaking it in the final in 26.48. Lucy Hope of Edinburgh took 2nd in 27.49 and Italy’s Giulia D’Innocenzo was 3rd in 27.73. European Long Course Champion Florian Wellbrock broke his own meet record in the men’s 1500 in a time of 14:29.53, improving his previous personal best of 14:33.25 and his old meet mark of 14:36.53. Norway’s Henrik Christiansen was just over five seconds back for 2nd in 14:34.51. Another Norwegian Tomoe Hvas broke the National Junior Record in the men’s 100 breast in both prelims and finals, clocking 59.24 in the morning and then winning the final in 59.05. Denmark’s Philip Greve (59.17) and Switzerland’s Yannick Kaeser (59.33) were a close 2nd and 3rd. Hvas also won a close race in the men’s 50 back, touching in 24.30 to narrowly get by Stan Pijnenburg (24.47), Markus Lie (24.48) and Jesse Puts (24.66). Kyle Stolk of the Netherlands won the men’s 200 IM in 1:55.60, coming just .08 off of Hvas’ 2017 meet record. 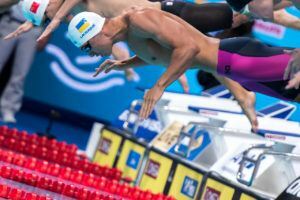 In addition to his 4th place finish in the 50 back, reigning SC World Champion Puts won the men’s 50 free in a time of 21.57, clipping Finland’s Ari-Pekka Liukkonen (21.58) by .01. Pijnenburg (21.76) and Stolk (21.82) took 3rd and 4th. It was a 1-2 for the Dutch in the women’s 50 free with Kim Busch (24.53) scoring the win and De Waard (24.57) placing 2nd. Nina Kost of Switzerland placed 4th in 24.78, breaking their National Record previously held by Sasha Touretski (24.91) from the Budapest World Cup just one month ago. Another interesting note there: Touretski previously represented Australia, and in her final meet before switching over to Switzerland, she swam her lifetime best (24.76) which would stand as the National Record had she done it just a week earlier. Maarten Brzoskowski gave the Netherlands their sixth win of the day in the men’s 200 fly, falling just a quarter second off the meet record in 1:53.26. Nils Liess broke the Swiss National Record to finish 2nd in a time of 1:55.00, lowering his previous mark of 1:55.37. 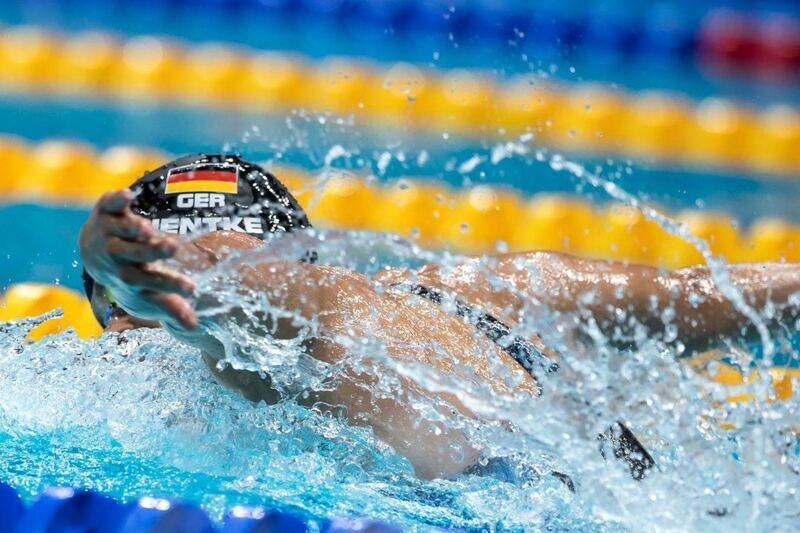 Nils Liess in the 200 fly and Nina Kost in the 50 free got both new Swiss Records.